With Corian® Quartz, you get the ultimate freedom of expression in kitchen design, combining enduring beauty with valuable functionality. Corian® Quartz is easy-to-clean, and is NSF/ANSI 51 Certified for food contact are also Class I (Class A) fire rated. Since Corian® Quartz is nonporous, stains do not penetrate the surface. With proper cleaning, it also resists the growth of mold, mildew, and bacteria. 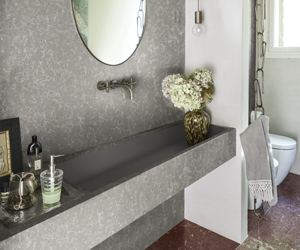 High-performing Corian® sinks can be perfectly integrated with your Corian® Quartz surface to create the sleek appearance of a single surface. Corian® Quartz also pairs brilliantly together with such materials as stainless steel, wood, and glass. Corian® Quartz (formerly Zodiaq® Quartz) is backed by a 10-year limited product warranty.